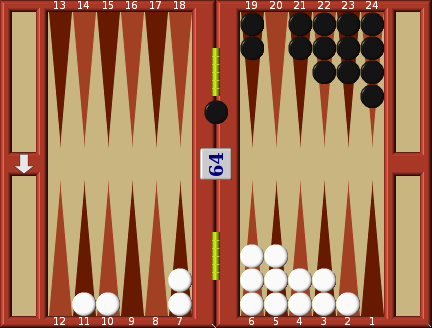 It is of course impossible to win every game of backgammon, but if is quite possible to win more than you lose, so that overall you become a consistent winner. Duplication and non-duplication are very important aids to winning. 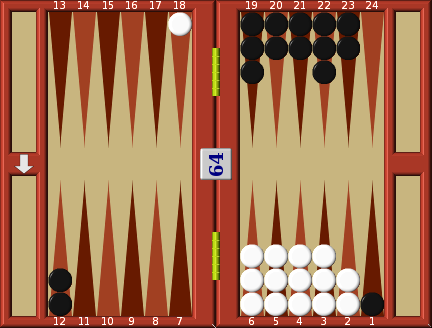 The moves selected on these principles are so inconspicuous that many backgammon players, even after years of playing, remain unaware of them. 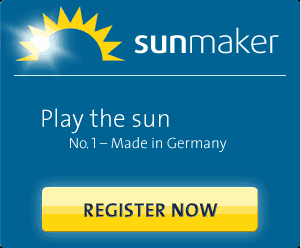 They put their opponent's wins down to luck and never grasp the secrets behind the selected moves. A simple example of duplication may be seen in diagram. Here White has thrown a 4:1; how should he play it? The correct play is to move 13-8. Should Black get a 4 he will have to use it to re-enter his man and will not be able to hit the White blot which is exactly 4 spaces away. 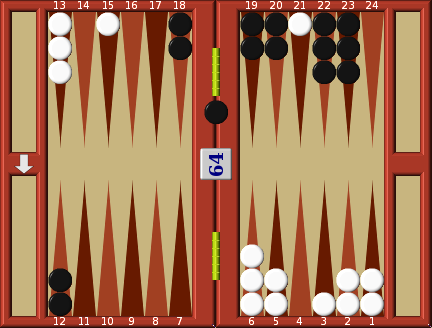 (Of course, if Black gets the miracle 4:4, White can correctly conclude that luck is on the side of his opponent!) 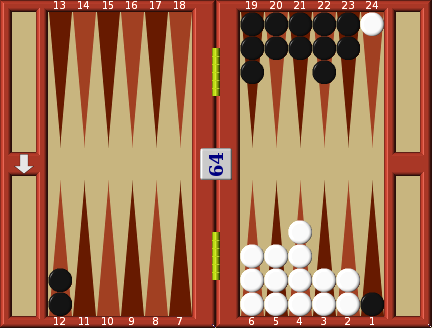 If White had left his blot on 9, Black would have been able to re-enter with a 4 and hit the blot with either 5:4 or 4:5, 2 chances in 36. 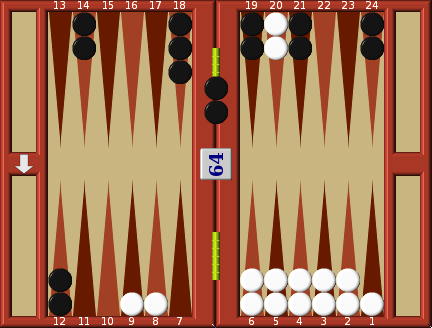 By placing the man on 8, Black can now only enter and hit with 4:4, 1 chance in 36. By making use of duplication White reduces Black's slim chances of entering and hitting the blot by a further 50%. Exactly the same principle applies if you are forced to expose two blots. The dangers of having two blots hit at the same time and the difficulties of re-entry are so great that it is essential to do anything to reduce the risk to the absolute minimum. Duplication can often be used to solve this problem. Diagram is an example of duplication in a two blot situation. White has just thrown 5:3. 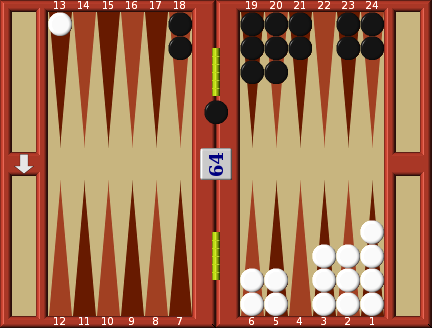 There is nothing that White can do to cover his blot on 3, so he plays the 5 by moving 20-15 and the 3 7-4 as in diagram. Now Black can only hit both blots with the 1 in 36 throw of 3:3. Had he left the blot where it is, or moved it to 17, there are quite a large number of throws that enable Black to hit both blots. Duplication has again reduced the chances of two blots being hit to 1 in 36. 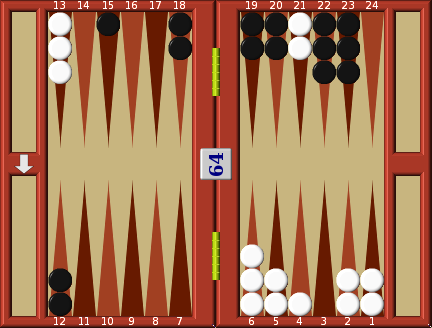 In diagram White throws 6:1 and decides to make use of duplication at a period when he needs to expose three blots. 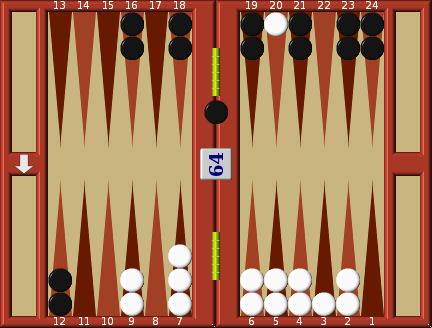 First he hits the Black blot on 15 with the 6 and then he moves the blot on 4, which he cannot cover, to 3. Once again Black must use any 3 to re-enter his man and will not be able to hit the blots on 4 or 15. The miracle 3:3 will of course cost you the game, but this one throw excepted, Black has no hope of hitting two blots at the same time on his next turn. In diagram White again throws 6:1. He uses his 6 to extricate his last man from the Black home board, but how should he play the 1? Again he must make use of duplication. In diagram you see how White carefully leaves his man on 18 where it can only be hit by a 6 and plays the 1 4-3. 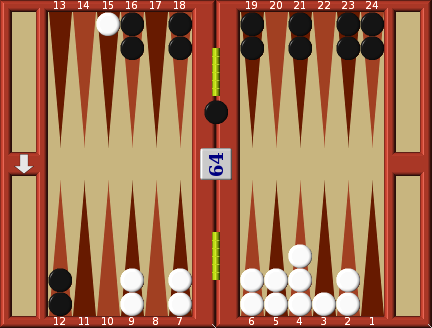 If Black uses his 6 to hit the blot it will be at the expense of extricating his last man from the White home board. In the circumstances he cannot risk leaving his man in your trap; he must take it out with any 6 and will not (except with 6:6) be able to hit the blot. 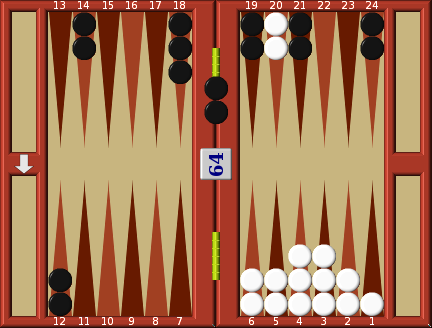 If White had moved his blot to 17 with the 1, Black would have been able to hit it with any 5, as well as removing his man with any 6. Form the habit of looking for situations where duplication can be turned to your advantage. If you have an opponent on the bar always pause before you select your move to see if duplication can be of assistance. In diagram White throws 4:2. His opponent must use any 1 or 4 for re-entry, therefore the safest places to leave blots will be 1 and/or 4 points away from the black men. White therefore moves 20-14 with one man where it can only be hit by a 1 or 4. The other blot, on 20, can also only be hit by a 1. Note how White did not move both men to 18 and 16 where they could be hit by a 6, 5 or 3; none of these numbers is required for re-entry and they are therefore available to hit blots. There are occasions when non-duplication is just as important as duplication. In diagram White must at all costs stop Black escaping. If he escapes he will run for home and be in a winning position. White has just thrown 5:1. He hits with the 5, moving 7-2, but how does he play the 1? 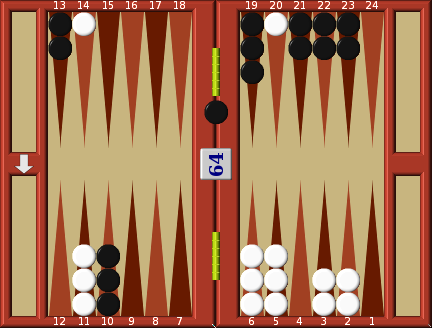 White must work on the assumption that Black will re-enter and hit the blot. If this happens then White will be forced to use any 5 for re-entry, so that the spare man on 7 will not be available to re-hit the black blot. So he now selects his move for the 1 on the principle of non-duplication and moves 7-6. Now 3 or 4, neither of which is required for re-entry, will be available for re-hitting Black. White is going all out to close up his home board and has just thrown 6:4. He cannot cover his blot, so again he must plan his moves on the assumption that Black will re-enter and hit the blot on his next turn. Should this happen White will need any 5, 3 or 2 for re-entry. Therefore he must place his men in positions where they can re-hit the black blot with 6, 4 or 1. White plays 8-2 with the 6, and 9-5 with the 4. Now any 1 or 4, neither of which are required for re-entry, will be available to hit on 1. 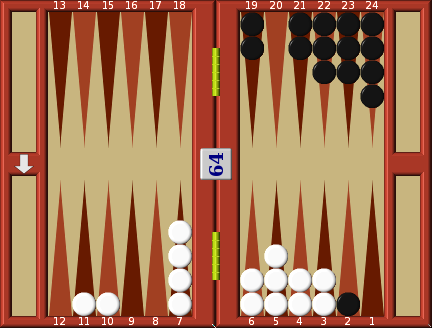 In contrast look now at the same move played incorrectly. Here White has played 9-3, 8-4. In this position he could only re-hit on 1 with a 2 or 3, both of which are numbers that may be needed for re-entry and may not therefore be available for hitting the blot. 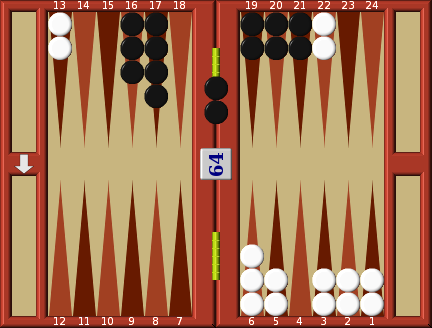 The uninitiated backgammon player will not notice the difference in these two moves. At first sight they both look as though they give two builders with which to re-hit the blot, and when the second move fails to hit, the innocent player may well blame his bad luck rather than his lack of skill! In chess it is necessary to think many moves ahead. 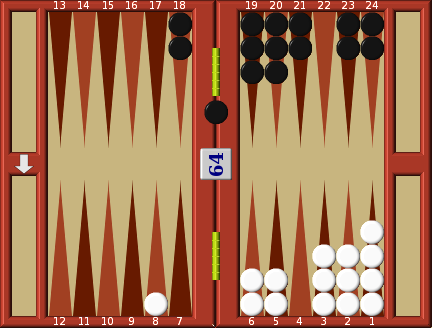 In contrast, because backgammon is based on the unexpected dice, many players think that there is no need to think of the next throw of the dice; but as seen in this last example, it is necessary to think ahead by two turns, one for your opponent and one for you. To bring up his builders to enhance his chances of hitting any Black blot that manages to re-enter on 4. He must escape with his last two men from the black home board. If White moves one man 13-8 with his 3:2 he will only be able to hit on 4 with a 4. This he cannot allow to happen, since every 4 that he gets will be needed to remove his men from the black home board. He must move his men so that a hit is possible with a number other than a 4. The correct move is 13-10, 13-11. Now all 4s can be used to extricate his men, and any 6 will hit on 4. He will not have reduced his chances of escape and hitting by blocking himself with duplication of a vital move. Duplication and non-duplication moves are a great aid in increasing the chances of a subsequent throw being to your advantage. They help to put the law of probability on your side, not on your opponent's side.